Quilts can be made in many different ways and it is important to first realise the many different endings your quilt can have. You need to consider where the quilt will be placed, what it is to be used for, who it will belong to and the personality of the person or area it is intended for. Color is a very important part of this. 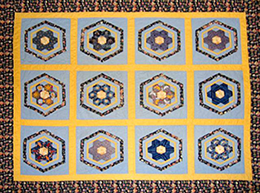 For example, if the quilt is to go in a quiet room for a baby where the surrounds are all in baby blues and yellows, the it is probably not a good idea to make your quilt out of bright reds, blacks or orange as it will look a little out of place and not tie in with the overall theme of the area! You need to look at the style of quilt you are wishing to create – is it supposed to be a geometric shape or can you be more relaxed and open with the pattern? Are you going to make it a straightforward patchwork quilt? Or use embroidery or appliqué on the quilt, and if so, how much and where? Look to your surroundings for inspiration and ideas. For example if you live in the country you could use flowers, greenery and trees, and if you live in the city you can use people, houses and interesting buildings. If you are not very confident at designing your own quilt, perhaps you are a beginner or simply stuck for inspiration, then take a look at the quilt kits section or quilting pattern section for a little bit of help. Remember when you create something it is truly your own work, and if it doesn’t end up quite the way you intended it doesn’t necessarily mean it has turned out for the worse! Remember your mistakes might not be viewed as mistakes through everyone else’s eyes, and if your quilt is a unique and individual design then no-one will ever know what it was “supposed” to look like. Give it a try and you might be pleasantly surprised at how creative you actually are! Play around with a couple of ideas, you can use colored pencils to give you an indication as to what colors you might like to use. Use graph paper if you can’t draw straight lines and look to magazines, books and the internet to see what other people have done if you need a little more inspiration.